This Easy Black-Eyed Pea Salad is perfect for New Year’s – but will also bring rave reviews at picnics, potlucks and family get-togethers! This fresh, delicious and Easy Black-Eyed Pea Salad is just one more proof that this little Carolina cook is a tried and true southern girl. Although we hadn’t moved to a foreign country, Scott and I had a bit of culture shock when we relocated, back in 80’s, from Wisconsin to North Carolina. There were so many different ways of doing things, saying things and a zillion crazy things those southern folks ate. The flour was different, barbecue was vinegar-based, kids drank sweet tea instead of milk (horrors for a Dairy State girl) and the variety of peas and beans had my head spinning. That’s just to mention a few of the anomalies (to us) we encountered. Let’s just say we felt a little out of place, and when New Year’s rolled around that first year, there were more strange things to learn. “I’m fixin’ a new black-eyed pea recipe for New Year’s”. “We’re going to mama’s for New Year’s – can’t wait for her black-eyed peas”. “Did you get your black-eyed peas for New Year’s yet?” What??? I quickly learned that eating black-eyed peas for New Year’s was a legendary tradition that dated back to the Civil War. The story’s told that, during General Sherman’s March in 1864, the Union Army raided the Confederates’ food supplies but left peas and pork. They thought these rations were for the animals rather than for human consumption. Those supplies ended up as the very thing that got the Southern soldiers through that cold, rough winter. Hence black-eyed peas evolved over the years into a representation of good luck. Although I’m not a believer in luck coming from the type of food one eats, I love culinary history and have joined my Southern brethren in enjoying black-eyed peas as a New Year’s tradition. I guess there would be those who would say I’m not a bonafide southerner, since I don’t serve the customary black-eyed peas cooked for hours with fatback and collard greens; or in a rice dish called Hoppin’ John. Instead, each year I enjoy coming up with a simple and healthier way to carry on the New Year’s black-eyed pea tradition. 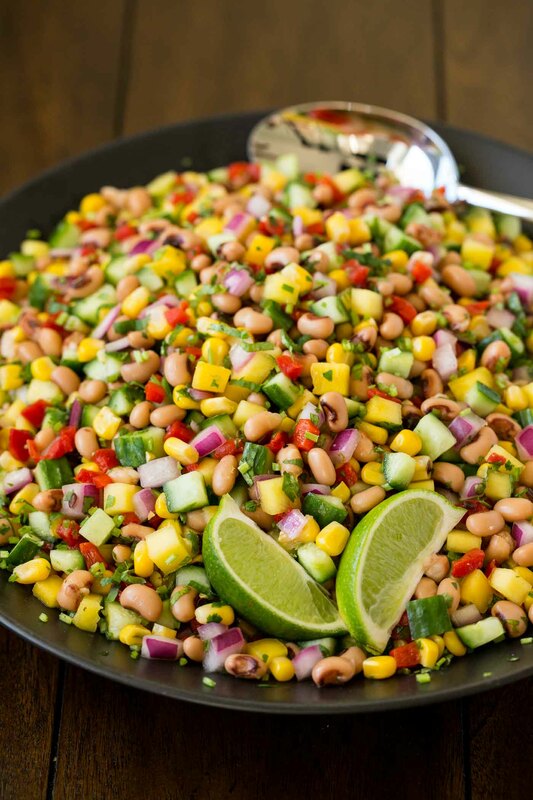 This year’s version is an easy black-eyed pea salad with lots of rainbow-hued veggies, all tied together with a super fresh lime-cilantro dressing. It’s the kind of fresh, healthy salad you’ll find yourself craving and it’s perfect, on its own or as a side to sandwiches, soups and entrees. A bonus with this salad is that it also makes a delicious dip or salsa served with chips or pita. The recipe makes a large batch, but you’ll find it will go fast. If there is any leftover salad, it will make wonderful lunches and quick, healthy snacks. What will you need to make this Easy Black-Eyed Pea Salad? Nothing out of the ordinary. Grab a few cans of black-eyed peas at the grocery store. You’ll also need one can of corn (see notes below) and a jar of roasted red peppers. Throw a red onion, a bunch of cilantro, a mango, an English (seedless) cucumber and a bag of limes in your cart as well and you’ll be good to go! Making the salad is as easy as opening a few cans, doing a bit of chopping and mixing up the super simple dressing. Give the salad a few hours in the fridge before serving and then enjoy. I’m not promising this Easy Black-Eyed Pea Salad will bring the legendary southern-style good luck, but this southern girl does promise lots of rave reviews. This Easy Black-Eyed Pea Salad is super versatile. Don’t like corn? Skip it. Love corn? Add two cans. Don’t care for cilantro? Use fresh basil instead. Can’t find a ripe mango? No worries, the salad will still be delicious. Tailor the recipe to your likes and the availability of ingredients. Just don’t skip the black-eyed peas or you’ll have to change the name. But hey, that’s not such a bad idea. I like the idea of “Easy Cannellini Bean Salad”, how about you? If you’ve never purchased canned black-eyed peas you find them in the same section as the canned beans (kidney, garbanzo, Great Northern, etc.). Even though they’re called “peas”, they’re actually a bean. Don’t think this salad is only a New Year’s dish, it will be a wonderful year round for family meals as well as large group get-togethers. The recipe makes a large batch, but leftovers will keep well. This Easy Black-Eyed Pea Salad can be made a day or two in advance. Combine the black-eyed peas and corn with the dressing but keep the other ingredients separate until a few hours before serving. Then combine everything to allow the flavors to marry and meld. The only thing that takes a bit of time when making this Easy Black-Eyed Pea Salad is chopping the veggies. Not for me though! I have a little magic trick that helps me put this salad together in the blink of an eye. If you’re a frequent visitor here at The Café, you’ve probably heard me mention this Vidalia Chop Wizard before. It’s truly a little kitchen workhorse! I use mine all the time and it has saved me hours in the kitchen. I’ve never been a huge fan of canned corn till a friend introduced me to this Summer Fresh corn a few years ago. It’s the next best thing to fresh corn during these long, cold winter months. The kernels are small and stay nice and crisp. It’s carried by just about every larger grocer in the same section as all the other canned corn. If you love fresh, delicious chopped salads like this done, I’m quite certain you’ll also be a fan of our Chopped Mexican Salad. It’s one of our most popular recipes and has been pinned well over a million times! Scott and I want to wish all of you a happy New Year. Thanks for being such an amazing audience to share our life and recipes with. We’ll see you all in 2018 – stay tuned for lots of new recipes, tips and stories. This Easy Black-Eyed Pea Salad is perfect for New Year's - but will also bring rave reviews at picnics, potlucks and family get-togethers, year round! Combine black-eyed peas, corn, chopped roasted red pepper, cucumber, mango and half of the cilantro in a large bowl. Combine fresh lime zest and juice, vinegar, sugar, salt and pepper in a small bowl. Stir well to dissolved sugar. Pour over black-eyed pea mixture and stir well. Taste and add more sugar and/or salt, if needed. Refrigerate for 2-3 hours then garnish with remaining cilantro just before serving. Store any leftovers in an airtight storage container in the refrigerator. It wouldn’t feel right for us not to have black-eyed peas for New Years. I’ve made a salad with them several times and it was a big hit. The next time I make it I will use your recipe and hope that it’s as vibrant and picturesque as yours. Happy New Year! Although I’ve never made black eyed peas, your salad looks like a delicious celebration to my eyes! A terrific way to start the new year for sure! Love black eyed peas and try to eat them to celebrate the New Years too. This looks and sounds like a great salad Chris. Hope you had a happy holiday season and wish you and Scott a very Happy New Year! How very colourful and tasty! Happy New Year, Chris, Scott! Thanks, Angie! Happy New Year to you! So colorful and pretty! And now I know the story of WHY! I have never heard this, and it sure delighted me. We are going to look for that summer corn, I had no idea! Are you sure that you aren’t a chef? you know everything about food!